Guitar Pick Holder Necklace with skulls on it. Don't go for those machine made holders from China that everyone has!! Buy a unique item that is handmade! This is a HANDMADE wire sculpture guitar pick holder necklace with Skulls. The holder holds 3 medium gauge, removable picks that are included with every order (can be altered upon request). The necklace is Leather and adjustable. We use Tibetan Silver for the beaded accents. This piece is copyrighted as of April 2012 and can not be purchased anywhere else. 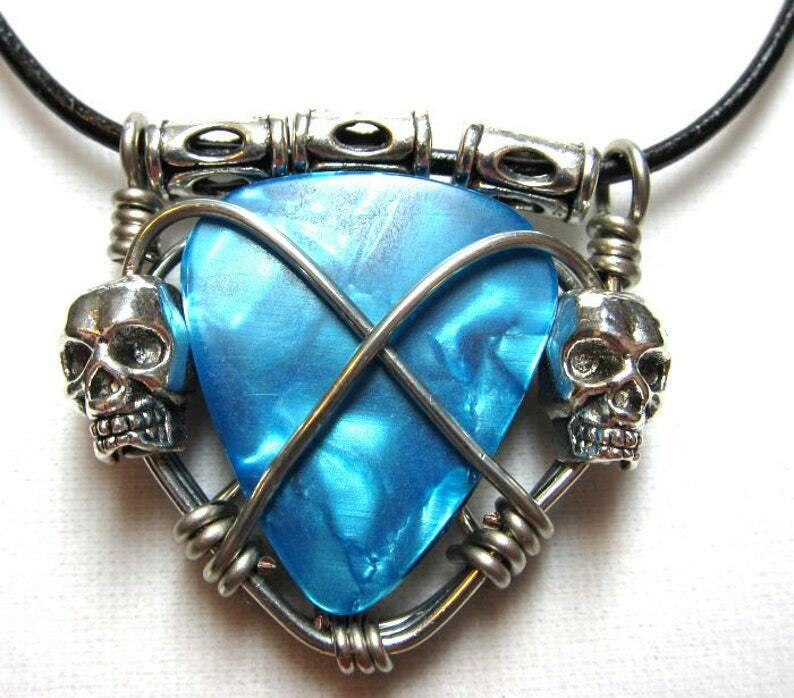 This unique sculpture is solely created and distributed by Twisted Picks Guitar Pick Jewelry. Each holder is made to order, and may have slight variations. This wire is Silver plated copper. Please message me with any questions and thank you for looking! *** THIS ITEM IS AN ORIGINAL AND EXCLUSIVE DESIGN OF TWISTED PICKS. ARTIST OWNS ALL RIGHTS TO THESE IMAGES AND THIS DESIGN MAY NOT BE REPRODUCED BY ANYONE WITHOUT PRIOR WRITTEN CONSENT! Livraison rapide , emballe dans un papier cadeau !, merci au vendeur vous êtes au top !